26th June 2016 – Three PACE athletes now know they are heading to the Olympic Games in Rio after securing their selections with victories at the British Championships and Olympic Trials over the weekend in Birmingham. 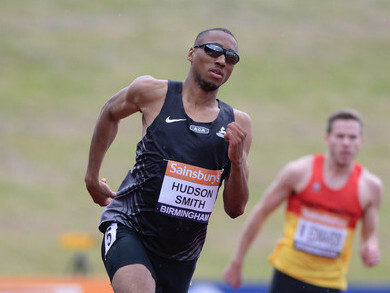 Matthew Hudson-Smith (GBR) led the way with one of the performances of the meet. Blasting through the first 200m of his 400m final, Matthew led into the home straight and was never threatened as he crossed the line in 44.88 seconds. A seasons best and another glimpse at the ability he has. Dina Asher-Smith (GBR) and Stephanie Twell (GBR) both had to work right to the line in their respective 200m and 5000m races but both ultimately justified their favourites tag and added another national title to their growing list of honours. These three were all announced in the first wave of British Athletics selections. Others who still have time to earn their place are Michael Rimmer (GBR) and Rhys Williams (GBR) who finished third in the 800m and 400m hurdles races here. Michael and Rhys have both been selected to represent Great Britain in the European Championships and will hope to do enough here to catch the selectors eye. Tom Lancashire (GBR) chances in the 1500m final were cruelly ended when he was clipped from behind and sent sprawling to the track. However, he is another athlete who has been selected for the Europeans and will literally have to pick himself back up for that. There was a sad end to the Championships for Perri Shakes-Drayton (GBR) who after battling injury for three years lined up in the women’s 400m. Having won her heat she was moving well in the final until a quad problem forced her to stop and has subsequently put her out for a little while again. Finally, there was a farewell to competition for Chris Tomlinson (GBR). Chris has been one of the world’s best long jumpers for the last 15 years and he announced his retirement after a career that saw him medal at the World Indoor Championships and European Championships; place 5th and 6th at the Olympic Games; qualify for three World Championships finals; and break five British Records. His best distances are 8.35m outdoors and 8.18m indoors.